The Unlimited Wash Club is a membership service that enables you to wash your vehicle every day for one low monthly fee. Your Unlimited Wash Club membership benefits are redeemable at any of our Xpress Carwash locations. The price for membership is based on the plan that you choose. 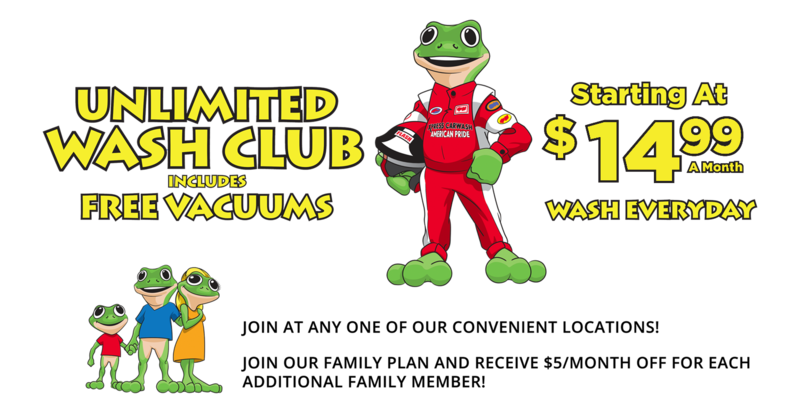 Our Club Memberships start at only $14.99/month and are available at any one of our Xpress Wash locations. Ask a team member about it today! Yes! We offer a Family Plan discount on our top three membership plans (Manager’s Special, Wax & Shine and Premium w/ Tire Shine). Additional vehicles can be added and the plan would be $5 less per month if added to the same Credit Card used on the first account. There are no long term contracts or cancellation fees. Yes. Your credit card will be billed monthly on the anniversary date of your initial enrollment. Does each of the vehicles I own need its own membership? Yes. Each car you wish to participate in the Unlimited Wash Club must have its own unique Unlimited Wash Club account and RFID sticker. Additional cars are eligible for our Family Plan discount. You may cancel by filling out the form HERE, or by sending us an email at info@americanpridexpress.com. If done via our website, a representative will contact you within 48 hours to confirm your cancellation request. Cancellations must be done at least 5 days prior to the billing renewal date. The program allows one car wash per day, per each vehicle enrolled in the Unlimited Wash Club. A valid credit/debit card is required to sign up. Plan may be cancelled at any time via our website, or by sending a cancellation request to info@americanpridexpress.com at least 5 days prior to the billing date. Cancellation of this plan prior to the month end does not entitle the member to any refund or credit. Regardless of the cancellation date, all wash plans will remain active until the anniversary renewal date. Transfer or removal of the Speed Pass sticker will result in automatic termination of the wash plan. To transfer a plan to another vehicle, please speak to a team member at any Xpress Wash location. The plan will terminate if the monthly charge is declined by the credit card processing system. You will be prompted to update your payment information at your next visit. In the event of a Unlimited Wash Club rate increase, all members will receive a minimum of 30 day advance notice. Weather or equipment maintenance may affect the availability of wash services without refund or credit. American Pride reserves the right to cancel this plan at any time. Only personal vehicles are eligible for this program. Business vehicles may be eligible to participate in our Commercial Fleet Wash Program. See more on our Fleet page.